I just received a newsletter from Maggie's Crochet and enjoyed this notice "Our new grandson Andrew was born Saturday November 25th at 12:02. Much to our surprise all the babies in the nursery were wearing crocheted pumpkin hats!" Included in the newsletter is an adorable picture of the baby is his crocheted pumpkin hat. The newsletter always has pattern booklets and yarns that are featured or are on sale. Usually there is a free pattern for a simple project included with each order. I've loved all the patterns that I've ordered from this site, and enjoy seeing the regular newsletters. 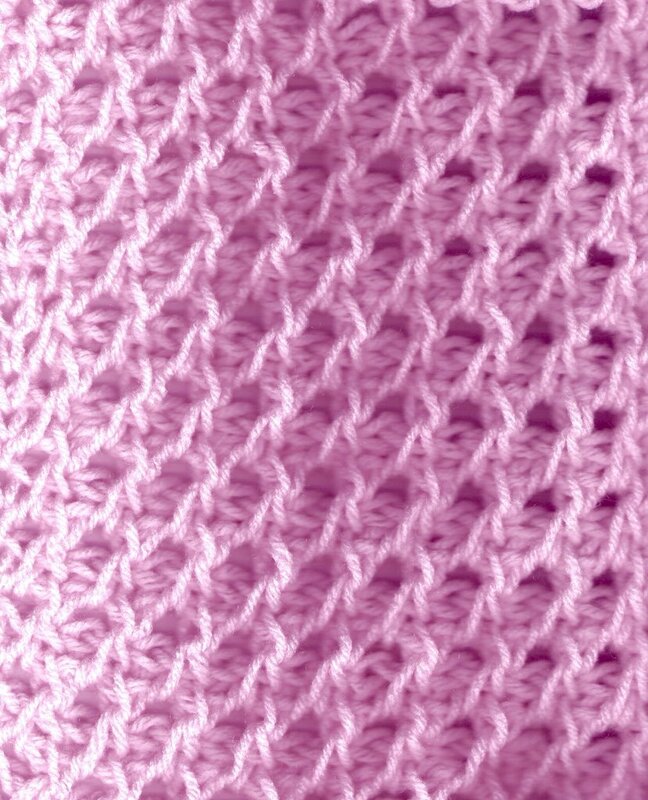 If you still think that Tunisian crochet is thick, heavy & stiff - try this beautiful shell stitch. It's more open than it looks in the picture, very lacy. It's # 30 in the 101 Stitches book. This is #97, a wonderful two color pattern. Wish you could see it in real life! The color contrast is stronger than the scanned picture shows. I made this blue & white block, and also a pink & white block. I'm thinking of trying 3 colors. maybe a yellow, white, green, white striping pattern. 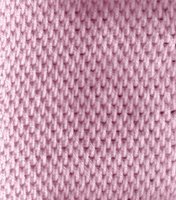 Please note that these are not pictures from the book, they are scans of stitch swatches that I have made. #41 a pattern using Tunisian Doubles (Book calls this double loop, here is my major complaint with this book. I'll write a full entry on this.) 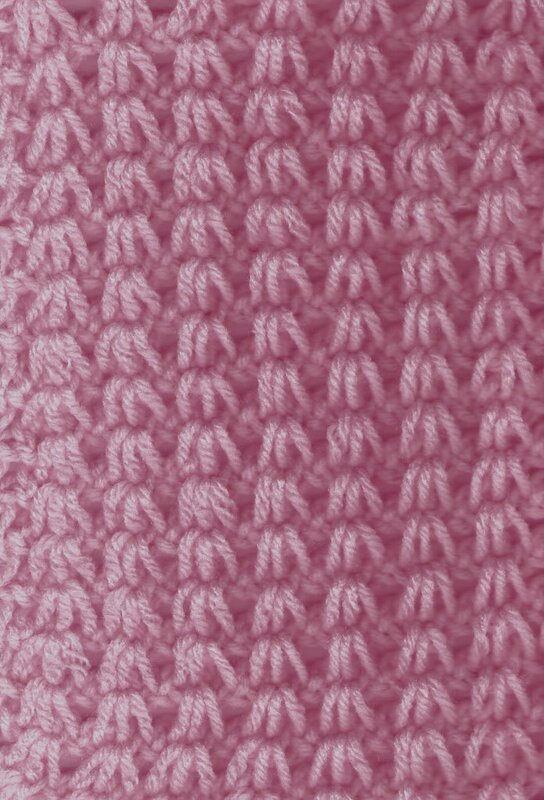 But this is a beautiful stitch pattern, I have some ideas for using this. From Encyclopedia of Tunisian Crochet by Angela "ARNie" Grabowski, published by Abilene Publishing in 2004. This is an excellent book on Tunisian crochet, I refer to it frequently for stitch information. I love that it includes historical information, controversy, and a bibliography, as well as how tos, tips, and photos. I enjoy looking at the pictures and re-reading so much of the book. I'm eagerly awaiting the publication of book #2! 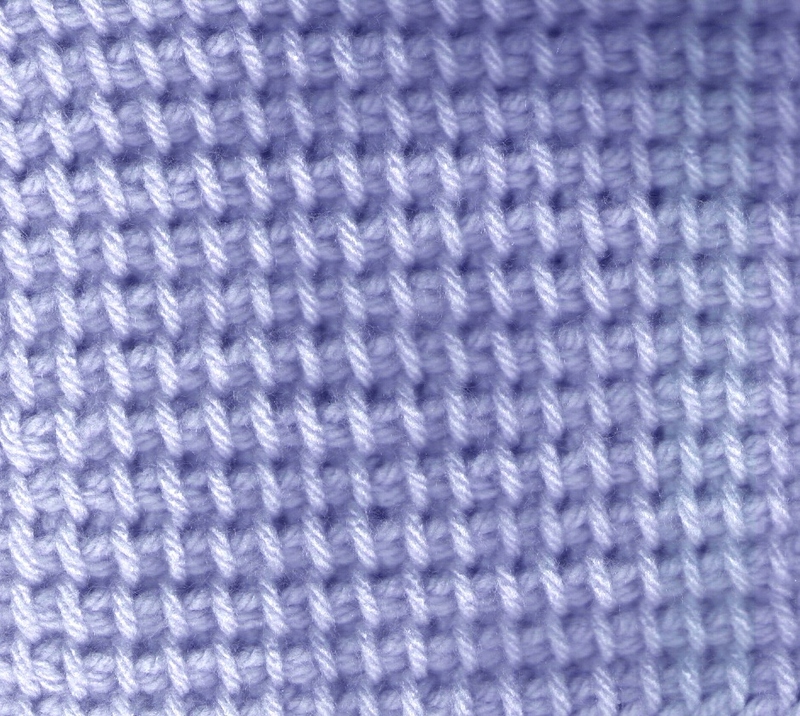 Tunisian Full stitch, some older books may call this a Plain stitch. 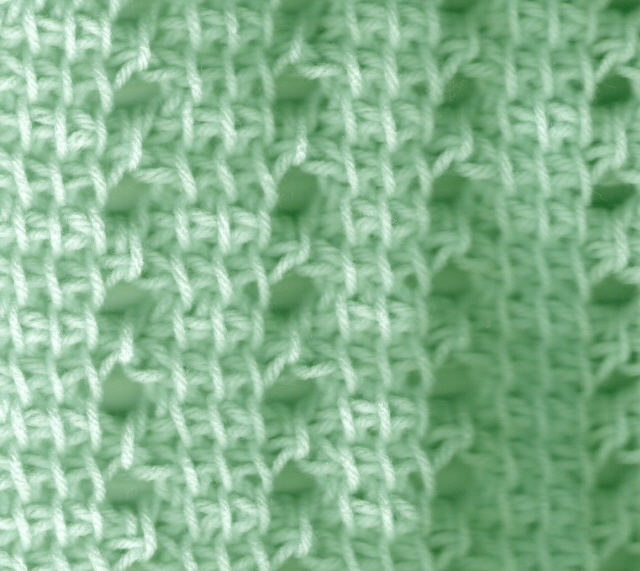 It is made by inserting your hook between stitches instead of into the stitch. Very dense, with some color changes I'm thinking a baby afghan. 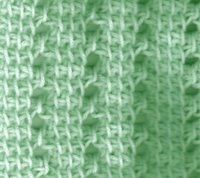 Tunisian Simple Stitch, also known as, Basic Afghan Stitch and for those of us who crocheted in the '60's and early '70's we called it simply Afghan stitch. 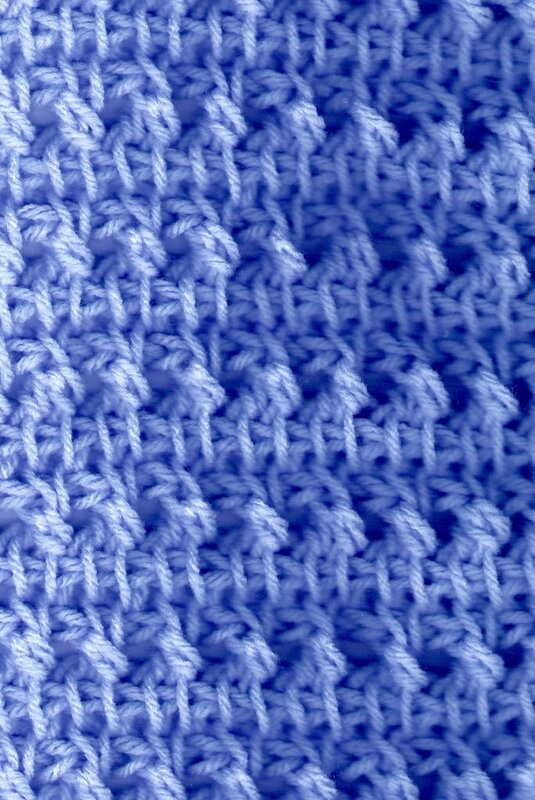 Some people still think that this is the only stitch you can do with the afghan or Tunisian hooks. And way too many people complain that the stitch is "heavy" and "stiff". They should try the new larger Easy Tunisian hooks, or the Moez hooks, and try some of the hundreds of different stitches and stitch patterns that are in these books. 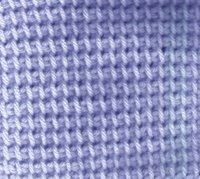 Note: I did not make this swatch. This lovely piece was made by one of my math students as a gift for me. She didn't even know that it was Tunisian, and that I have a great love for this form of crochet! 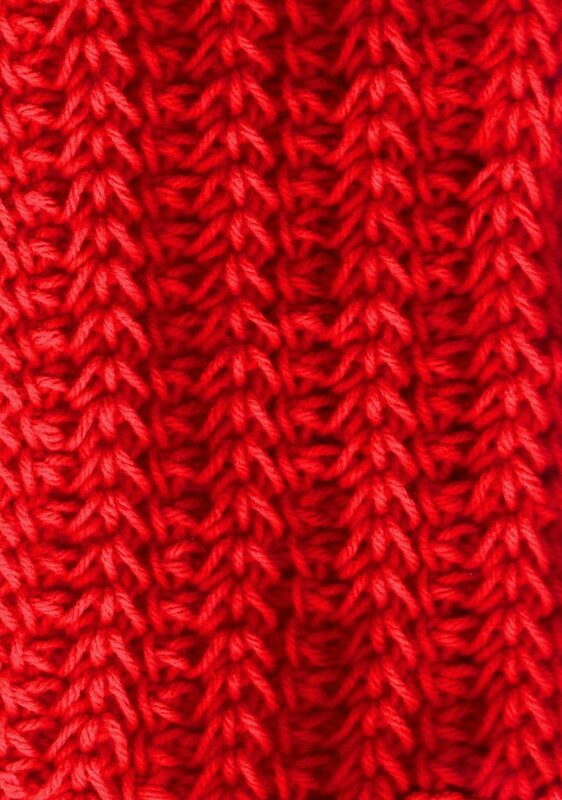 Take note of the even stitches and the perfectly horizontal and vertical lines, this was worked with fantastic tension. The Class Preview at Michaels went well. There were 6 instructors and we were at 3 tables previewing our classes and giving demonstrations. I brought along some "starts" of Tunisian Simple Stitch to let people have a chance to try the stitch. I also had some small swatches and projects that I was working on to give them ideas. 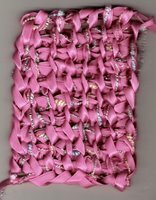 I had a ball of glittery cord that was pink, blue and gold; this was left over from a Tunisian Mobius wrap. Anyway, I picked up a spool of pink ribbon and a spool of blue ribbon (50 cents each) and tried a swatch with all 3 fibers. 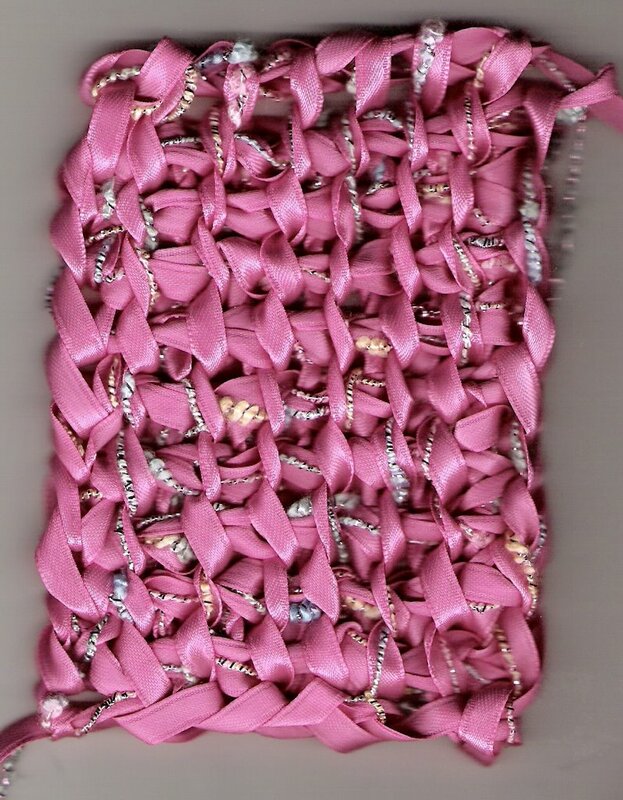 The cord kept slipping between the two ribbons, so i dropped the blue and used the cord and pink ribbon. It's beautiful, but would require at least 6 spools to get a decent length for a fashion scarf. For now, it'll stay a pretty swatch. 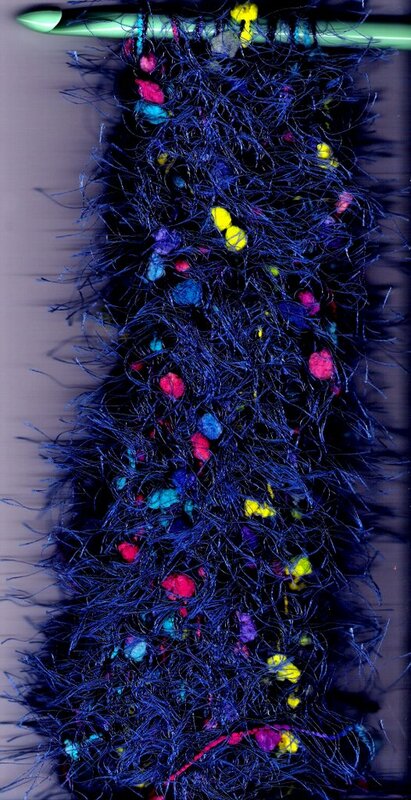 Then I also had 3 balls of Lion brand Fancy Fur in a bright blue, it's got "globs" of aqua, hot pink and yellow mixed in. It was a fun project to showcase Tunisian and keep me occupied during the Preview. Sunday I was back at Michaels for the Warm Up America "joining party". Only three of us showed up, but we worked hard and had a lot of fun. I brought along about 18 blocks that I had made up in different Tunisian stitches and stitch patterns, all either red, white or blue, or in 2 of those colors. This is an excellent project for practicing stitches, seeing how different fibers work up, and definitely learning how to work to gauge. The blocks are to be 7 x 9, then 63 blocks sewn or single crocheted together to make a blanket approximately 63" square, then a simple border added. We were amazed at all the different sizes of blocks which had been donated. Some about 6" square, others about 9" square and others that seemed to be about 5 x 10. We sorted them out by size, then by colors that we thought looked nice together. We were able to sort out about six 25-square small afghans or laprobes. Jackie bagged the squares so that someone with some time can just grab a bag and start joining. Sue assembled one, I had one almost assembled by adding 3 regular crocheted squares and several knitted squares. I took it home and finished assembling & added a simple white border. Monday was Shawl Ministry night. I'm working on a Tunisian Shells & Columns shawl in a peach or light coral worsted weight. I've also been working on a shawl in Tunisian doubles in purple Homespun. Tuesday was our Sit N Stitch night at Michaels. I worked on some samples of different Tunisian stitches to add to the knit and crochet samples on the board at Michaels. Two of my Tunisian scarves are on the display board for up-coming classes. Now, I'm trying to get the word out about the classes. Last night and tonight I worked on more Warm Up America blocks while practicing Tunisian stitches. 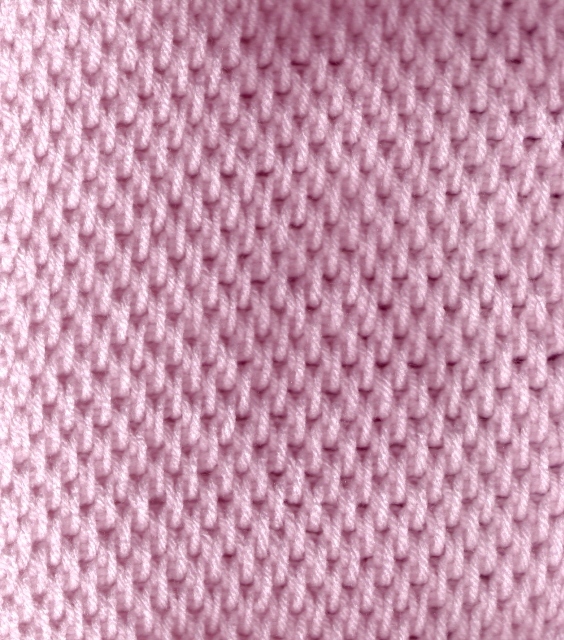 I've found two stitch patterns that might just become that sweater vest that's been on my mind for some time. getting things ready for a class that I'm going to teach. At the last Yarn Event at Michaels I pitched a class idea to the new Event Coordinator, and she liked the idea. Yesterday we met and I dropped off samples to display, and scheduled the class day and time. Yesterday I also "prettied up" the patterns I will be using and printed them out on heavy paper. I think I might purchase some card stock to print up the patterns that I will hand out to the students. Today I need to write up a class description, including cost, and make a list of materials needed. I also need to provide a source of the Tunisian hooks because Michaels doesn't carry them. When all this is together I need to email it to the Event Coordinator, and then gather materials for some demonstrations. I probably need to do a lot of cleaning & sorting of my crochet bag, I have everything!! in there. 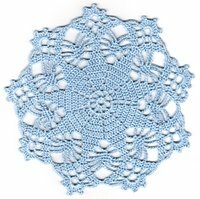 One of the crochet-related things I'm doing this week is searching books and online for easy Christmas ornaments for the CGOA meeting at the end of the month. I'm especially looking for very easy snowflake patterns. I've selected one that I think will be our starting project. I'm making it up in a variety of brands and weights of thread, so I can discuss selecting threads. Then I'm also working it up in #3 fashion thread, and probably a sport weight yarn. For those that haven't worked with thread before, I'm going to have them make up the snowflake in larger fiber and once their comfortable working in rounds and lacy stitches, we'll try to go smaller. I've already made up a snowflake in #10 South Maid. This is the ball of thread that I recently tossed to my husband and said "Put this is the garage or the breezeway, you can use it for tying up tomato plants or something. Just don't let it get back into my crocheting thread." It split terribly, and it's stiff as a board. I also made up one in the fashion thread, very pretty, but way too soft. I don't think this will block, or stiffen well, either. Tuesday evening, at our crochet in public, I purchased a 1 pound ball of #10 thread, a ball of #20, and a metallic crochet thread. 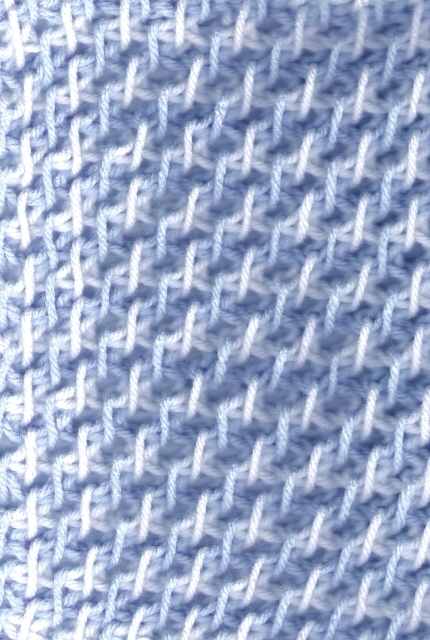 I've bought this before with silver or gold metallic threads, but this white has a sparkly iridescence. I made one snowflake, and I had a lot of problem with the thread twisting. These are going to be really pretty, but don't know how many people will want to fight the thread. Maybe I can scan a few snowflakes and post them. What crochet books are you reading? It's been a week since I posted, what have I been doing? I feel like the answer must be "running in circles". I know that I meant to write last week when the mailman was so kind and brought all the books that I had ordered at Amazon. Two were new books that came from Amazon, the others came from various used book stores and libraries. So I guess today will be book reviews. Hooked: A Crocheter's Stash of Wit and Wisdom, edited by Kari Cornell, Published by Voyageur Press, 2006. This is a collection of stories about learning to crochet, people who inspired the authors to learn to crochet, and why they crochet. I haven't had time to really lose myself in the reading yet, but I'm eager to, I recognize several of the author names. At the beginning of each story there is a short bio of the author. What I really love is the black and white pictures of crochet stitches, swatches, and hooks scattered through the book. 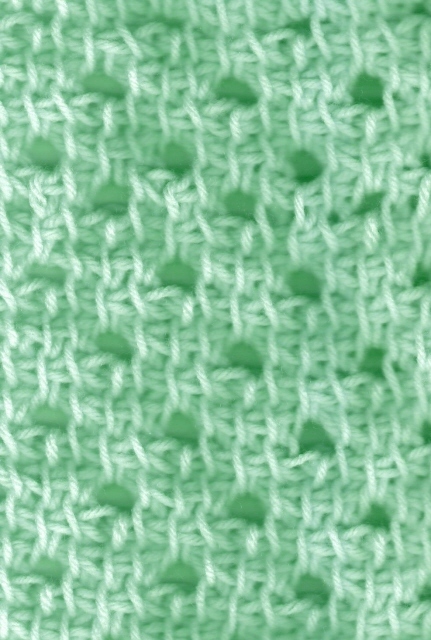 Geometrics: A new way to crochet, over 25 projects by Ruthie Marks. If that title isn't long enough, the title page includes "an introduction to dragon curves, golden ratio, and Fibonacci sequence". Now you know why I had to get this book, it's crochet and mathematics! There is a variety of projects including a scarf, poncho, placemats, afghans, pillows, and rugs. Includes a brief "how to" section, and useful information such as hook size charts, actual-sized pictures of hooks, yarn sizing charts (loads of information) and information on exactly what yarns were used for each of the projects in the book. I bought several small booklets "Favorite Doilies of Rita Weiss", I've already got my eyes on a pinwheel, Lily of the Valley, Snowflake and Spring Flower. "Weekend Baby Afghans to Knit and Crochet" by Jean Leinhauser & Rita Weiss. Did I really need more afghan patterns? No more than I needed more doily patterns, I guesss. "Crocheting Afghans", edited by Rita Weiss, Dover Publications 1979. 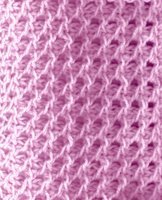 Many of the patterns in this book are traditional granny squares and ripples, but there are also patterns using Tunisian "Afghan Stitch" and one that looks like it combines Tunisian and Bullion or roll stitch. Better Homes and Gardens Afghan-Stitch Crochet, 1989. This book starts with a how to section which includes some historical notes, hook chart and several stitch patterns. Projects include small tote bags, sachets, placemats, table runners, pillows and afghans, sweaters, scarves, hats and mittens. Wish I knew someone having a baby, there is the cutest sweater, and a beautiful spring coat for a little girl. What a gorgous Easter outfit this would make. Yesterday I blocked the black Spider doily, along with the small doily I finished sometime ago. 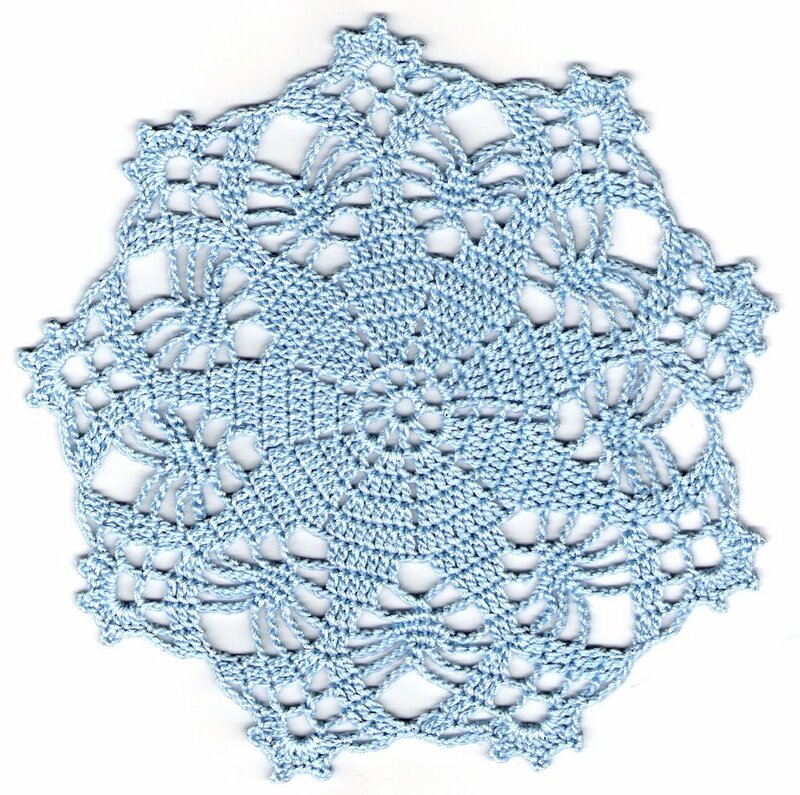 It is named Rainbow Star doily, from SouthMaid "Timeless Doilies to Crochet". Mine is approximately 7", it's hard to measure exactly, you can't measure point to point, as it has 9 points! Whose idea was this? Where's the symmetry? Okay it doesn't have horizontal or vertical, or diagonal symmetry, but it does have it's rotational symmetry. I guess I'm learn to love it's odd-pointiness, because it is a pretty little thing. Tonight I started on it's twin, finished 9 out of 13 rows. They are going on a trip along with the blue Crochet-a-Long doily that I posted about in September. 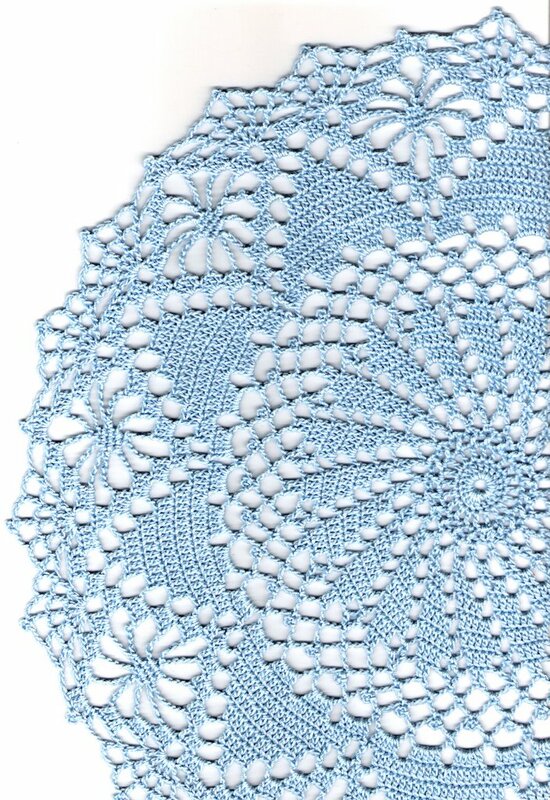 Blue Crochet-a-Long doily 13 1/2"
They're not identical, but I think they go together very nicely. It will make a nice set.